Yesterday, it was announced by President Donald Trump that Nikki Haley would be resigning from her position as U.N. Ambassador and leaving at the end of the year. Haley, the former governor of South Carolina, has done a phenomenal job as U.N. ambassador and become a rock star within the GOP. 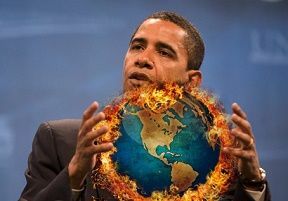 The resignation was done at the White House with much pomp and circumstance in the Oval Office. This is not a normal exit for an ambassador, which begs the question, what is next for Nikki Haley? Rumors and speculation are abound. 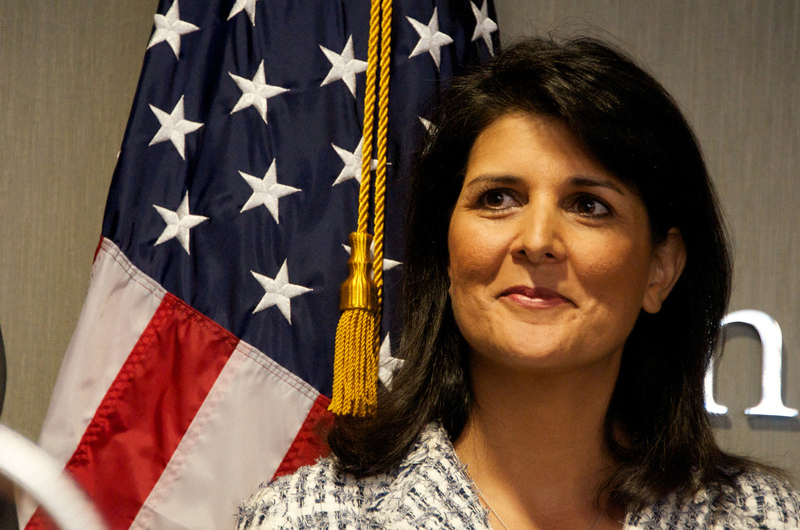 Will Nikki Haley run for Senate or maybe, just maybe VP? Haley stated yesterday that she would not be running for president in 2020 and only campaigning for President Trump. But it is hard to believe that Haley’s political career is over when she has such a political future. Nikki Haley is a child of immigrants who rose to become South Carolina governor and then President Donald Trump’s ambassador to the U.N., before her resignation Tuesday. She will leave her U.N. post at the end of the year. Haley, whose parents were from India, brought diversity to the administration and Trump’s naming her to the post showed he was willing to welcome Republicans who had been lukewarm toward him during the presidential campaign. Haley had little experience in international affairs prior to her appointment. But she quickly became a prominent voice for Trump’s foreign policy. With the Democrats being so divisive between men and women, is it possible that Nikki Haley becomes the VP for 2020? President Donald Trump went to the United Nations and showed the world what a strong American leader looks like. Gone are the eight years of apologies under Obama, welcome to the new vision of the United States, embracing the land of the free and the home of the brave. This was an eloquent and masterful speech that has the LEFT and the MSM reeling. President Trump stated, “We do not expect diverse countries to share the same cultures, traditions, or even systems of government. But we do expect all nations to uphold these two core sovereign duties: to respect the interests of their own people and the rights of every other sovereign nation. This is the beautiful vision of this institution, and this is foundation for cooperation and success.” And at the same time, Trump put Iran and the “rocket man” on notice, “The United States has great strength and patience, but if it is forced to defend itself or its allies, we will have no choice but to totally destroy North Korea”. The United States has great strength and patience, but if it is forced to defend itself or its allies, we will have no choice but to totally destroy North Korea. Rocket Man is on a suicide mission for himself and for his regime. The United States is ready, willing and able, but hopefully this will not be necessary. That’s what the United Nations is all about; that’s what the United Nations is for. Let’s see how they do. The Full transcript can be Read HERE. Strong, sovereign nations let their people take ownership of the future and control their own destiny. And strong, sovereign nations allow individuals to flourish in the fullness of the life intended by God. In America, we do not seek to impose our way of life on anyone, but rather to let it shine as an example for everyone to watch. This week gives our country a special reason to take pride in that example. We are celebrating the 230th anniversary of our beloved Constitution — the oldest constitution still in use in the world today. This timeless document has been the foundation of peace, prosperity, and freedom for the Americans and for countless millions around the globe whose own countries have found inspiration in its respect for human nature, human dignity, and the rule of law. Generations of Americans have sacrificed to maintain the promise of those words, the promise of our country, and of our great history. In America, the people govern, the people rule, and the people are sovereign. I was elected not to take power, but to give power to the American people, where it belongs. In foreign affairs, we are renewing this founding principle of sovereignty. Our government’s first duty is to its people, to our citizens — to serve their needs, to ensure their safety, to preserve their rights, and to defend their values. All responsible leaders have an obligation to serve their own citizens, and the nation-state remains the best vehicle for elevating the human condition. But making a better life for our people also requires us to work together in close harmony and unity to create a more safe and peaceful future for all people. The United States will forever be a great friend to the world, and especially to its allies. But we can no longer be taken advantage of, or enter into a one-sided deal where the United States gets nothing in return. As long as I hold this office, I will defend America’s interests above all else. But in fulfilling our obligations to our own nations, we also realize that it’s in everyone’s interest to seek a future where all nations can be sovereign, prosperous, and secure. 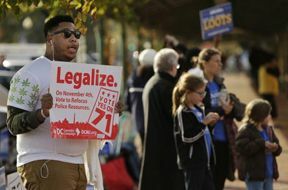 America does more than speak for the values expressed in the United Nations Charter. Our citizens have paid the ultimate price to defend our freedom and the freedom of many nations represented in this great hall. America’s devotion is measured on the battlefields where our young men and women have fought and sacrificed alongside of our allies, from the beaches of Europe to the deserts of the Middle East to the jungles of Asia. It is an eternal credit to the American character that even after we and our allies emerged victorious from the bloodiest war in history, we did not seek territorial expansion, or attempt to oppose and impose our way of life on others. Instead, we helped build institutions such as this one to defend the sovereignty, security, and prosperity for all. For the diverse nations of the world, this is our hope. We want harmony and friendship, not conflict and strife. We are guided by outcomes, not ideology. We have a policy of principled realism, rooted in shared goals, interests, and values. South Carolina Nikki Haley is Donald Trump’s pick for United States Ambassador to U.N.
OF COURSE I LIKE THE PICK, BUT WHY DO WE EVEN HAVE A UN THESE DAYS? President-elect Trump has tapped South Carolina Gov. Nikki Haley to be the post of United States ambassador to the United Nations. Haley has accepted the nomination. The South Carolina governor said in a statement that she was “honored” for the chance to serve the country as U.N. ambassador. Haley is the daughter of immigrants, from India is serving her second term in the South Carolina statehouse and is seen as a rising star in the Republican Party. She is the first female named to the Trump Cabinet. Haley will remain as the South Carolina’s governor until the Senate acts on her appointment. President-elect Trump has offered South Carolina Gov. Nikki Haley the post of U.S. ambassador to the United Nations and she has accepted, Mr. Trump’s transition team announced Wednesday morning. The South Carolina governor, in her own statement, said she was “honored” for the chance to serve the country as U.N. ambassador. 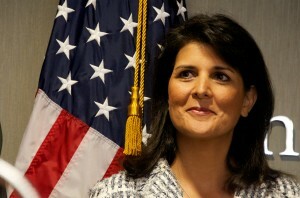 Haley said she was moved to accept the nomination for two reasons: “The first is a sense of duty. When the President believes you have a major contribution to make to the welfare of our nation, and to our nation’s standing in the world, that is a calling that is important to heed. The second is a satisfaction with all that we have achieved in our state in the last six years and the knowledge that we are on a very strong footing,” she wrote. Daily Commentary – Thursday, April 2, 2015 – So What Executive Order Does Obama Have Up His Sleeve?